The Nikkei Asian Review reports that LG Display aims to increase its OLED TV production capacity to 10 million units by 2021 - which is six times its capacity in 2017 (1.7 million). Next year LGD aims to produce around 2.8 million OLED TVs. LGD's investment in new OLED TV capacity will reach $18 billion by 2020. LG Display is enjoying a surge in demand for OLED TVs, and OLED TVs sales account for around half of its high-end TV sales (TVs with a price tag of over $2,000). In 2018 OLED's share in LGD's premium TV panes will grow to 70%. LG Display is confident it could even sell 20 million OLED TV panels each year, if it could make them. LG is "betting all on OLED" and minimizes its LCD investments as much as possible. 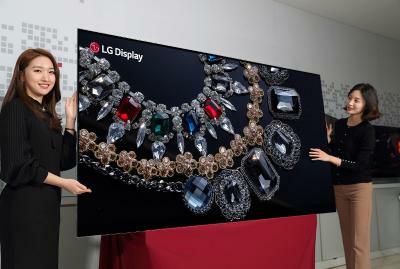 LG Display is currently shipping OLED TV panels to 13 TV makers - including LG Electronics, Sony, Philips and Panasonic. Sony sold about 200,000 OLED TVs in 2017 (all with LGD's Crystal Sound OLED technology) - and the company aims to sell 400,000 OLED TVs in 2018. LG Display will also start supplying panels to China's HiSense which the company hopes will be a major OLED panel customer.